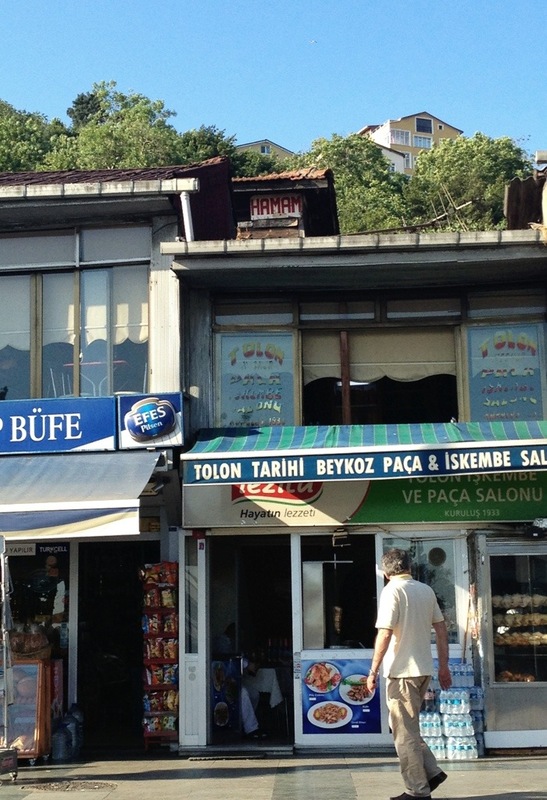 Lately in Istanbul: would you go to this hamam? I’ve not had a lot of time to write lately (work has gone crazy, and as the humanitarian crisis in Syria doesn’t look like it’ll be resolved anytime soon it may be a while before I’m back up to speed on here) so in lieu of all the cracking blog posts that are currently sitting half-written on my laptop, I thought I’d share a few glimpses of life in Istanbul instead. First up, this hamam. Yep, it’s a hamam. Squidged in behind a büfe and an iskembe restaurant on an unpromising stretch of road in Beykoz, this sign caught my eye as we sat in traffic. Perhaps you can eat chargrilled intestines while a big naked lady scrubs your back? Would YOU go to this hamam? I think I would, just to see what the deal was. I might not get as far as taking my clothes off, mind (I prefer the comforts of Cemberlitas Hamami usually), but you never know what soapy oasis might be hidden away back there. Oh thanks Mimi, that’s sweet!